earth friendly is a company based in Goa/India and run by three Germans. We develop unique lamps that we make ourselves in fair and eco-friendly conditions. Our goal is to create beautiful products to make people around the world happy. Together with our international design team, we create new ideas that are then hand-crafted with high-quality materials. Our principles include good working conditions, fair wages and protecting the environment, as well as treating everyone in the value chain in a polite and respectful manner. We call it the “earth friendly way”, and it is a code of conduct that guarantees that we as a supplier comply with the highest international standards. In 1995 we started manufacturing our illuminated paper stars trademarked as starlightz. To this day we have sold 4 million pieces. Our recipe for success consists of changing collections created by our design team, hand-crafted with high-quality materials and ideal working conditions for our craftsmen and craftswomen. The current collection, our 26th, includes over 100 designs – from traditional patterns to Indian, Oriental and even Scandinavian designs. Based on decades of experience in high-quality, fair and eco-friendly manufacturing of lamps, earth friendly has developed two new lamp programs. Juno and Looma stand for fresh, original designs and bright colours that create a warm, atmospheric light. The lamps comply with earth friendly’s proven 2D/3D principle. recognize earth friendly starlightz by the red star label. 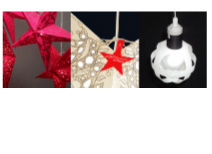 our paper stars are the safe, original & good star lights. 100% burn-proof / TÜV/GS-mark, UL-listing on earth friendly paper stars including distance protector and the original earth friendly powercord. all high quality materials for our starlights / years of craftsmanship / permanent quality checks. that‘s the collection no. 26 by earth friendly! constantly new colored paperstars and patterns / warm lights of the christmas stars / we go on in making classics and new trends. environmentally-concious manufacturing process / each of our co-workers is paid above average wages and therefore participates in the success of earth friendly. The original. Recognize earth friendly starlightz by the red star label. Our stars are the safe, original and available in wide variety to suit every mood and occassion. Each of earth friendly co-workers is paid above average wages and therefore participates in the success of earth friendly.